I’m trying to look at books the way a librarian might, in order to help get me better at thinking from a reader’s point of view. Here are the other posts in the series. 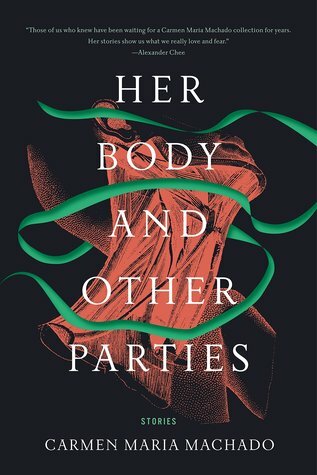 Her Body and Other Parties is a collection of short stories that centers around the horrific in a kind of fairy-tale way. (I recently talked about the relationship between horror and fairy tales here.) The writing is clear, elegant, and readable. “Once upon a time, there was a woman who…” is the main format of the stories, although I don’t recall the phrase “once upon a time” actually being used. The women in these stories have to deal with the consequences of their own desires, in a way that goes beyond a mere caution not to have them in the first place. They don’t always walk away from that reckoning, and they never walk away unchanged, although sometimes they do end up with someone who feels right. I would especially recommend this collection for women, queer, and non-binary readers who are exploring their sexuality at any age, and who don’t want to be lectured. I would also recommend this for male readers who are feminists or who are exploring the issue, or who have a broad range of tastes in the horror genre. This book would make an excellent book club book as well–there are a thousand and one discussions to be had about this book among readers of horror, but also romance and crime stories. I should give a caution about one particular story in the book, “Especially Heinous.” The structure is of an alternate Law & Order SVU TV episode guide, and really does include 272 episode descriptions of same. The plotlines build and interweave with each other, becoming increasingly strange, yet meaningful. The first few pages are necessarily not as rewarding as the rest of the story. In other words, stick with it; it becomes something truly memorable. Looking for more book recommendations? I always include more in the Wonderland Press newsletter. Sign up here. What Makes Horror Worth Reading?